I am wondering whether anyone knows what fleet numbers the names "Zoe" and "Delta" are allocated to? There's no information on the fleetwiki with those names as far as I can see. However, I'm pretty sure "Delta" was in the range of 441-445 and "Zoe" was 502 or 504. Hmm, can't seem to find the other post I made about it, oh well. Saw 920 and 921 coming back from Woden again today. Still don't know what they're doing, like last time, but they're always together when travelling to and from Woden. Can't really claim 'always' from two sightings, and 921 was alone when I saw it southbound on Yamba near the hospital on the morning of the 7th. Without the driver training sign on the back or the desto, it would probably have to be doing network timings. Alright, well 'both' times they were together or near each other. Also as it has not yet been mentioned, the red nose season is upon us and the STAGs again, 471 and 482 with red noses seen yesterday. I saw quite a few with the noses yesterday too. There's one maybe two that don't have one atm, I think it was 467 or something. Also @Busfinatic101, 621 was on the 65 south at 3:50pm again. 711 entered service this morning. I saw the photo of 652 at the city on the weekend, so that answers the other question. How about the others then, 653, 654 etc, are they out yet too? Followed 662 today as it was being delivered to Tuggeranong Depot on a trade plate, got some photo's but nothing special, plus it looks the same as all the other ones anyway. What is the name of the application for tracking buses; I wish to install something similar on my iPhone. I noted this afternoon, whilst walking from my office to the City Bus Station, that one of the Volgren Optimus buses was running on route 11; it arrived in Civic at 5pm. Next There and also Triptastic should both track vehicles. Apart from the fact that one of Triptastic costs money to download, do you know what the differences are between the two apps? On a side note, parts of the Canberra-region of Nextthere (realtime) aren't working. At the moment, the 200 and 300 aren't able to be tracked. Average fleet age is 11.23 years (was 11.9 at 1/1/2016), not including Dennis Darts. Been a while since these numbers were updated. They both have slightly different applications. Next There is better for savings your common/nearby stops to get a list of what is coming. Triptastic works well as it can show the whole network in one go and will show all the buses running on the network (if you zoom out) you can save stops in this too but it doesn't work as well, it's probably a more gunzel friendly app where as next there is more of a convenient app for those who just use 2-4 regular bus stops and want to see the next departures quickly. Something new to look for. With the renewal of all bus registrations, they are no longer required to display stickers. So you should start to notice their absence on all ACTION buses. Irisbus Agora Line 301 - 319, trivia. The fire extinguishers have been moved from the partial recess in the wall in the middle of the front below the windscreen, to a position on the left side just behind the partition between the entry and the saloon. Today, the below trip is operating using bus 664, but is showing as non accessible on NXTBUS; normally, tris trip uses a Belconnen PR100.2. This is confirmation that tracking equipment is being reused from old buses; it is no longer possible to accurately determin which bus is coming without seeing it yourself. Can I assume that NXTBUS is using timetable data? or is it actually using the information coming from each vehicle. Each bus also has an individual ID number, so even if the equipment is re-used, it *should* be re-numbered before being installed. Yeah. It's most likely a set-up error when 664 was being entered into the system. AFAIK the bus module only stores the vehicle number - the attributes will be stored on the NXTBUS database. If you can obtain definitive proof (like a photo of the PID), report it to Transport Canberra. Bus 507 has left the ACT as of yesterday; it is believed to be in the Sydney area. While it sounds similar to what was set up in 710-712, Scania are working with Transport Canberra to make bus drivers drive more fuel efficiently. Sounds like it has worked so far & the scheme is set to expand. 383 was travelling northbound down Northbourne Avenue today at about 07:40 today with something on the front desto (couldn't read it) and "TEST" on the back, driven by someone in a bright orange uniform (mechanic?). Also heard an announcement on the driver's radio about 422 being broken down northbound on Yarra Glen this morning. Bus 317 failed on Yarra Glen, Curtin this afternoon; there is currently a mechanics van and tow truck present. It is likely that it will be towed to Belconnen Depot later this evening. 477 was towed back to the depot, shortly after I passed 317 getting picked up, the tow truck was shortly after seen going to retrieve another bus. 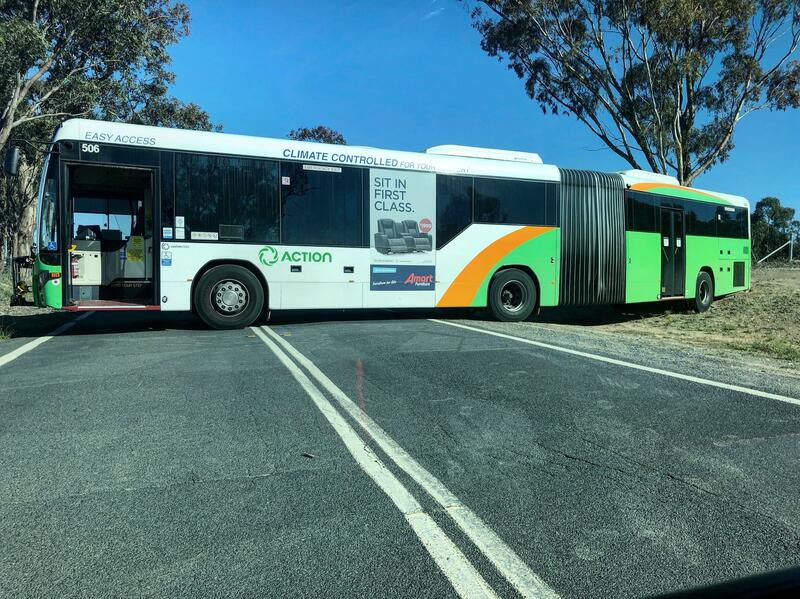 Bus 506 became stuck on Uriarra Rd, just west of Denman Prospect this afternoon; I am not aware of which route it was operating at the time. Bus 506 has been removed from Uriarra Rd; it was operating route 313 to Fraser this morning. It seems from a quick check of tracking applications, there are no PR100.2s or PR100.3s presently running; some may come out for the afternoon peak. This may be a historic first that there are no Renaults running during the off-peak on a weekday; previous holiday timetables have always still seen Renaults operating all day.